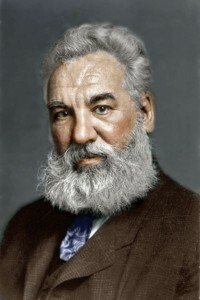 Alexander Graham Bell developed the telegraph, microphone, and telephone back in the late 1800s. We’ll be talking about electromagnetism in a later unit, but we’re going to cover a few basics here so you can understand how loudspeakers transform an electrical signal into sound. Look in the shopping list for Unit 14 – they are the neodymium magnets. There should be an order link as well for easy purchase. I couldn’t find the rare the magnets in my kit. Did you send them, or do I need to buy some? If so, where can I find them? I did the expirement without the springs and it works. No – the crystal radio needs an earphone that is non-magnetic since the signal is sooo low power. You can read about the different kinds of speakers in Unit 6. Can I use this use this for the crystal radio? Forgot to mention this earlier – you can attach a plug from Radio Shack and then you’ll be able to plug it into any stereo. Simply attach the end of each wire from your homemade speaker to the end of each wire from the plug and it should work just fine. Or, if you’re like me and you don’t want to wait to go to the store, attach one alligator clip lead to the end of each of the two wires from the speaker and attach one to the outside metal part of the jack and the other shoved into the center (be gentle so you don’t break anything). That should do the trick. Let me know how it goes! The only stereo that’s close to no plug is one that takes plug and battery’s. Will that work? You connect the two wires from the coil to the speaker inputs at the back of the stereo. You’ll need ones that don’t require a plug – the kind where you can simply insert bare wire into the contacts. Flip your stereos around and see if anything looks like it would be a terminal (contact) you can connect bare wire to. If you still have trouble, you can always attach an alligator clip to the bare wire and clip the other end of the alligator clip lead in the hole – just make sure you’ve got a good metal-to-metal contact. Question… how do you plug it in to the radio! Yes, that’s right – only it moves so quickly you often don’t see it (but you can feel it). Watch the first video and you’ll see what I mean. The great experiment for a science fair project would be to build several speakers and vary just one aspect of them, like the power of the magnet, or the number of coils, or the size of the speaker, etc. I’ve always wondered why speakers have magnets in them, do the magnets help the speakers to move? And I’m going to do a science project on sound waves, and I can’t decide what experiment really would be the best to use to help explain the topic. Do you have any suggestions? Look like our server had a hiccup. Go ahead and try again. The videos are not coming up for me; however, the YouTube videos are coming up okay. The videos for Unit 5, Sound, came up just fine for me yesterday. I have tested with new browser sessions under IE8, Chrome, and Firefox.